Whether it is snow, rain, blazing hot or some other weather that keeps us in the house, there is an opportunity to get off track with eating being confined in the house. 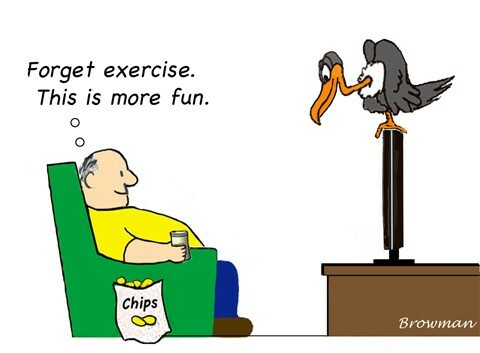 I find that when I am inside, unless I distract myself or force myself to work out, it will become easy to laze the day away, graze or overeat. None of those are good practices. As we enter the fourth week of 2017, you may be in an area that has already been hit with a snow day or two. What is the first thing people do when they hear a storm is coming? They run to the store and stock up to be inside for a few days. Sometimes…most times…well, almost always, that may include some unhealthy snacks. Even if your cart can steer clear of the tasty, sweet treats, chips with dip and high calorie junk food, there may still be a tendency to not move as much or eat more than the correct portion. Case in point, it is cookie season. Anyone alive knows what “cookie” season I am talking about. You see those sweet little faces out there peddling their deliciousness on just about every corner. Is your response always a resounding “I won’t take the cookies, but here is a donation”? Heck no! Once a year they build your anticipation. I suppose I was more mindful last year when it was this time, because I was actually in the Fit Mind Fit Body group. I was practicing my skills and in group once a week. I am pretty sure I may have avoided these little cookie monsters last year altogether. But oh this year one of my very best friend’s daughter with her snaggle-toothed smile is selling them! She was selling them last year too, but somehow I avoided the trap. I think she had her teeth then. Ha ha! There is grave disappointment seeing that a serving size is a mere 2 cookies for 140 calories. In what cruel universe would these angelic little bits of goodness be 70 calories each? This past weekend was rainy, I was in the house and so were these cookies. As they called to me sweetly and softly like wind on a breezy summer day. At the beach. With warm blue water. A massage therapist at my beckon call. A private chef. With rice cakes 1000 calories and king size snickers bars 5 calories. And soothing pedicures with soft music and candles. WAIT! Whew, what fantasy was I in? Hey y’all I was going there. My point being that I was in the house with food available but I had to be vigilant and mindful. It never ends, we must stay on point to stay on track. I did have those 2 cookies and ate each one with about 100 tiny nibbles! I also found a Saturday morning workout and moved around the house all weekend to keep from stalking the cookies in my pantry. So whether the weather keeps us cooped in the house or not, we still must stay mindful and know that a few days in the house doesn’t have to totally derail all of our success. I am holding steady with my 50-pound weight loss and even lost 3 pounds at the end of the maintain don’t gain challenge at work. Feel free to follow my progress and comment on ways to stay active and not overeat when in the house. This entry was posted in transformations and tagged cookies, mindful, weight management. Bookmark the permalink. Awesome! So encouraging! Keep up the great work, Sis!! Once again, you have made me laugh and nod my head in agreement. Thanks for sharing your weight management journey with us!!! Thanks to my husband’s co-workers daughters, we have some of those lemon girl scout cookies in our fridg right now! !